Isn’t it exciting to have your own swimming pool? Of course, it is! This means that you wouldn’t need to go far in order to get the relaxation you need from a pool. Aside from that, you can even invite your friends over for a pool party! It would even be more exciting if you have your own pool house! What is that? This is a separate structure, aside from the main house, which is located next to the pool. Those who come from the water can shower here, cook, dine and rest. Yup! It totally doubles the fun! You do not need to go the house in order to wash up. This gives guests more time to have fun and to bond together. Today, we are going to show a unique pool house which has a curved roof. You will surely love this design! Unique feature: A pool house that has a curved roof which is also a green roof at the same time. 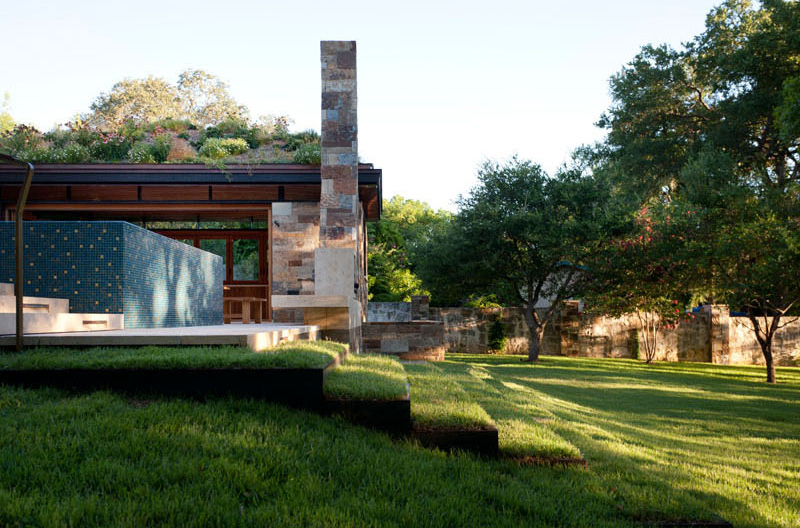 Murray Legge Architecture designed this pool house located in Westlake Hills, Texas. It includes a swimming pool, spa, and terraced landscape. 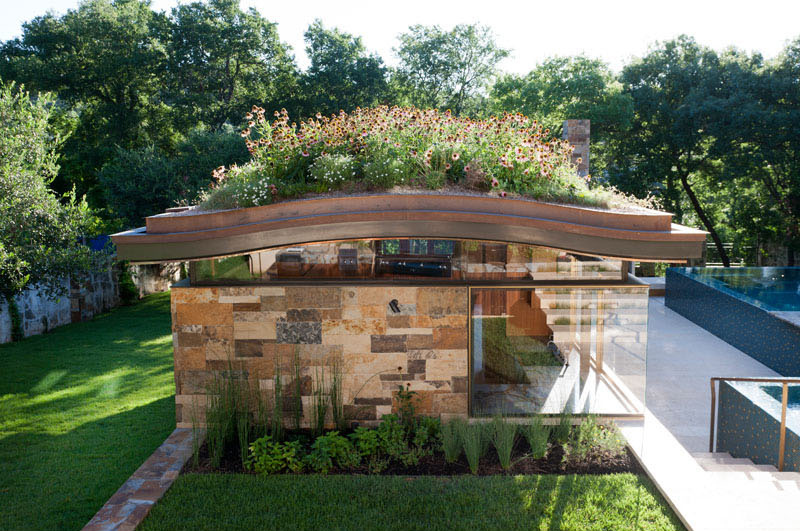 It is nice that the green roof also has some flowers it which adds more beauty to the structure. It is also a nice compliment to the landscape of the pool house. Seen here is the infinity edge swimming pool which is surrounded by a deck with plenty of space for entertaining and relaxing in the sun. The pool has blue floor tiles which adds appeal to the area. As seen in the first image of this feature, the pool has a beautiful design with creative steps that allows users to get in and out of the pool. 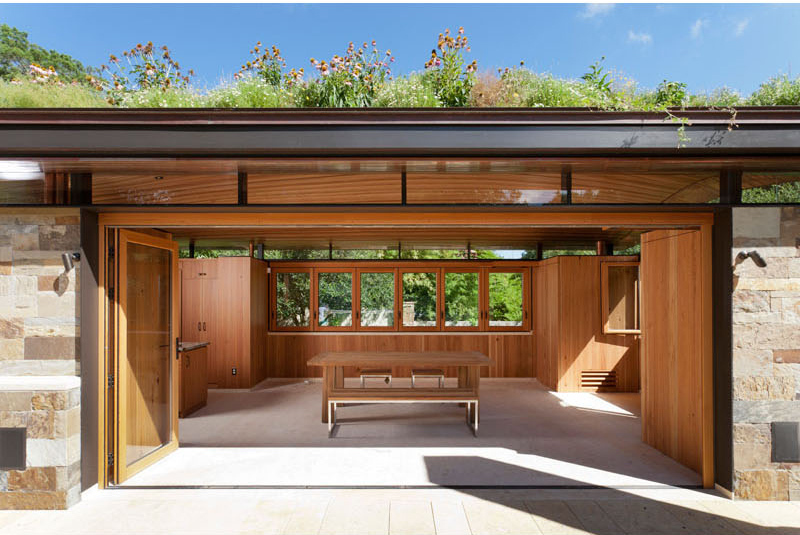 According to the designers, “impervious cover and storm water run-off regulations within the city are very restrictive.” Hence, in order to work within the guidelines of the city, a green roof was installed on the pool house. The pool house has an indoor-outdoor dining area which also comes with a high-end residential kitchen. Some portion of the pool house has large glass windows on it which makes it a little transparent just like the area near the kitchen. It would be nice to get a glimpse of the pool while preparing some snacks in here. 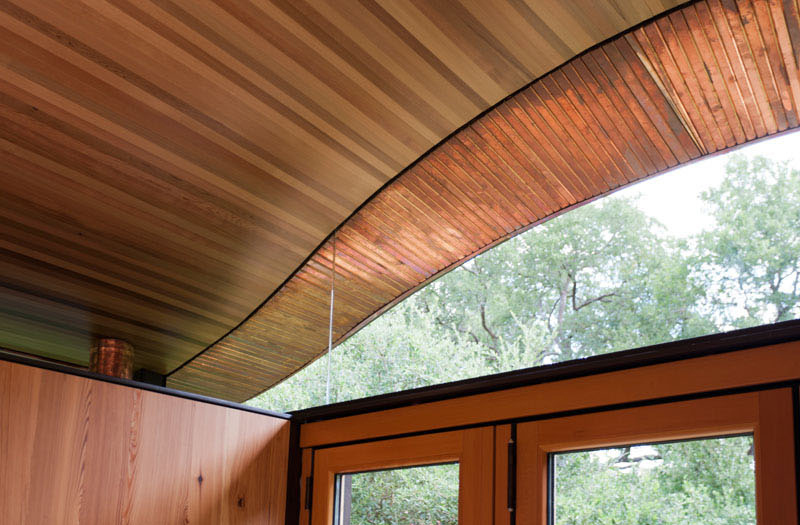 The curve of the green roof is also reflected in the interior of the pool house. 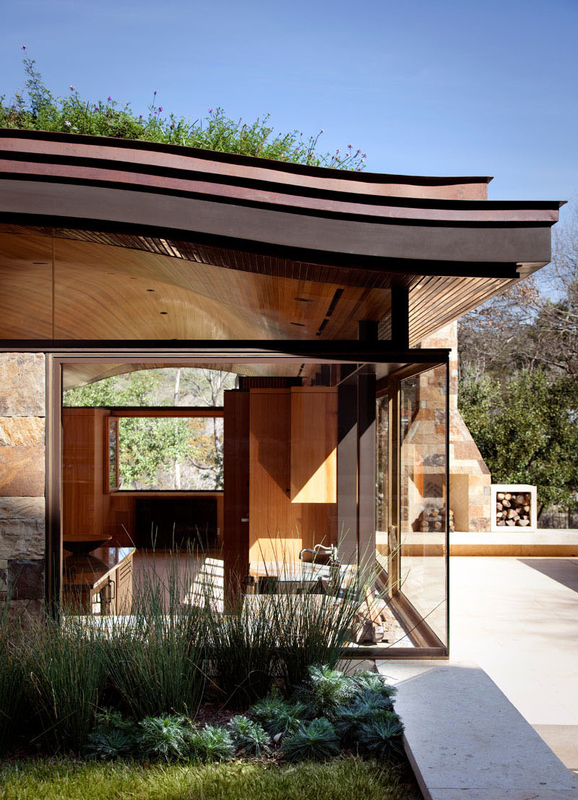 A wood boat-like vaulted ceiling echoes the surrounding canyon hills. This also makes the ceiling higher which adds to the brightness of the pool house. The interiors is just simple with lots of wooden elements in it. Folding doors are used to open the pool house to the swimming pool. There is also a bathroom and a shower room inside it. You can also notice that there are many windows around the pool house which allows a good view of the beautiful surroundings. The pool house is seamlessly connected to the outdoor area. 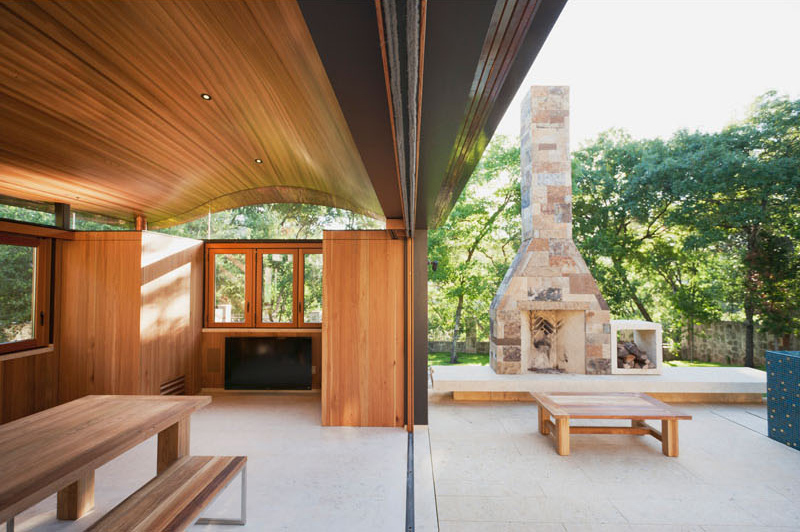 Off the living space is an outdoor fireplace which is the perfect spot to make the guests feel warm. It would be nice to have parties in this area complete with barbecues and drinks. Around the pool house is a landscaped area featuring a green lawn and some trees. You can also take a glimpse here of the mosaic tiles used around the above-ground pool. Also seen in the image is the steps that lead to the pool area covered in grass. 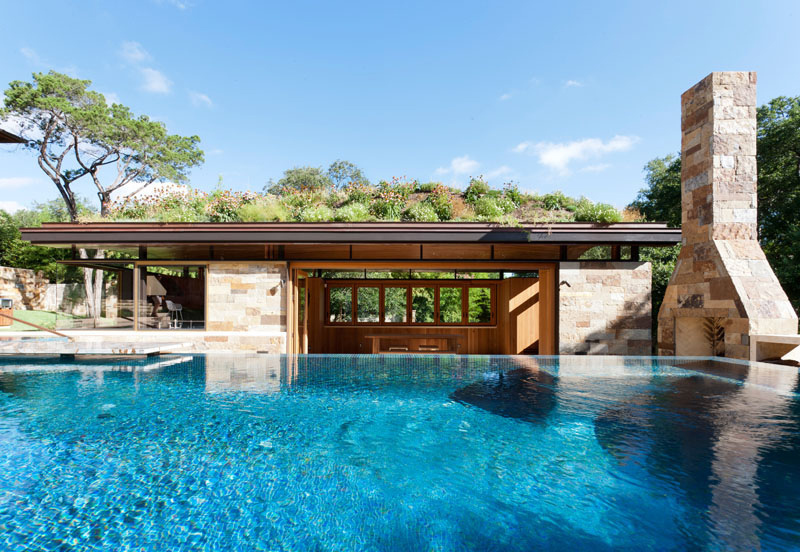 Since the pool house is on a slight slope, a suspended permeable stone terrace system was used. The image gives a closer look at the two stairs in the pool house. The upper image is the one with grass cover while the image below it is from the main house to that leads to the pool house in a lower area. Murray Legge Architecture designed this pool house which also features a dining area and a kitchen. 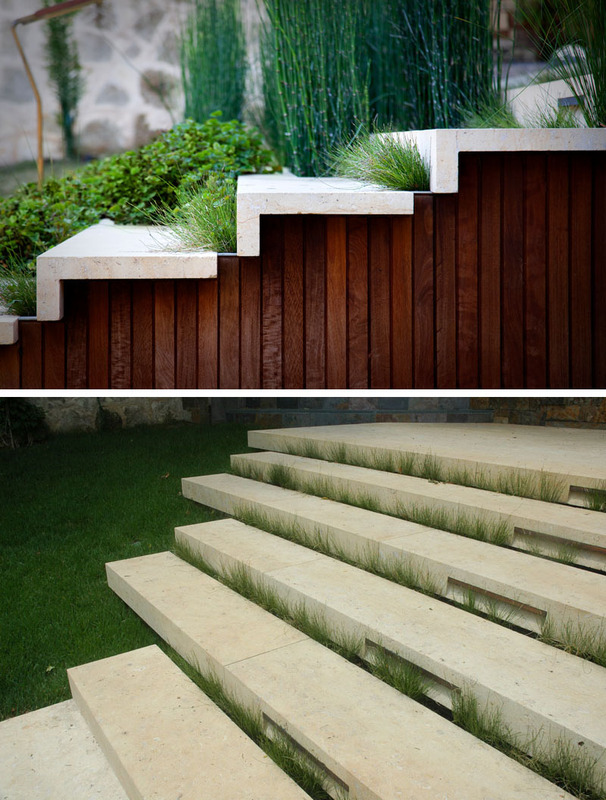 Its design isn’t just beautiful but also sustainable. Aside from its architecture, the landscaping around it added to its appeal which makes it even more inviting. Notice that there are many plants around it which are creativity planted in different areas. Of course, the swimming pool itself is a stunning feature too! Would you love to have a pool house in your home similar to this one?